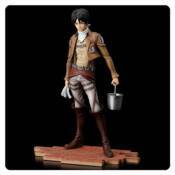 Attack on Titan Eren Yeager Cleaning Brave-Act Statue:Ho hum, cleaning time, Eren Yeager. Beautifully sculpted statue of the hero fromAttack on Titan.Comes with multiple option parts, including arms, swords, and cleaning supplies! Display Eren in several different poses! Measures 8-inches tall in 1:8 scale. The principal protagonist from theAttack on Titananime and manga series comes to your collection as a nicely detailed Brave-Act statue! This Attack on Titan Eren Yeager Cleaning Version Brave-Act 1:8 Scale Statue features the young member of the Scouting Regiment doing some monotonous cleaning. Beautifully sculpted in 1:8 scale, this non-articulated figure measures 8-inches tall and comes with multiple option parts (such as arms and swords) so you can display Eren Yeager in several different poses! In addition to all the parts of the Normal Version, this Cleaning Version includes a different head sculpt and exclusive parts like cleaning supplies. Normal Version sold separately.